Well, what has Dagney been up to? Apart from getting settled, I have also been quickly getting involved in ministry with the office here in Temecula! 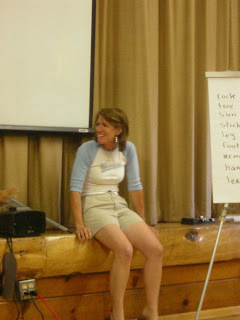 Last week I spent up in the mountains, at Idylwild CA helping to staff a camp called Total Vision. This camp gave the participants the opportunity to see the work of my organization at a much deeper level. I appreciated being introduced to the concepts of linguistics, phonetics and the sort. It was almost a brain drain! 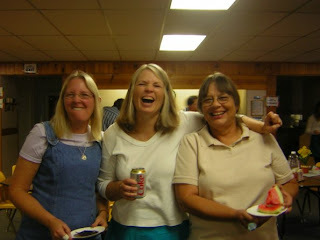 The ladies in the first picture are some great crazy missionary women. Do we have fun here or what? 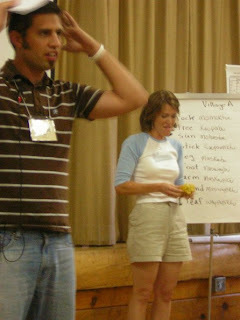 The next one is a skit that I took part in that demonstrated how confusing language can be. It is necessary to be a good listener. The topic was the usefulness of the bandana in missions living. I was supposed to have mistaken bandana, for banana. I demonstrated how to open it to then use it to cover your head for shade, how to wipe it over your limbs to "dry" off persperation, to "spread it out on the ground" and sit on it to keep from getting your bum dirty and then to "lay" it over your eyes to keep off the sun. What a mess! But Fun! I was really encouraged as I spent time with these amazing people. I was challenged to get over my recent move and to concentrate on the participants of this camp and be a part of God moving in their lives. It was so energizing to see God use my life, my testimony and such for His glory. I also met some new friends! Trevor and Sam Deck are missionaries who are recruiters in San Diego! We got along really well and I was so encouraged that I might now have some new friends. We plan on attending our required "recruitment" meetings together and traveling together. I am so blessed! The reason for me to go was to just spend time getting to know the few teenagers that attended. That was such a pleasure. These were some really mature, awesome teens. I was impressed with them. 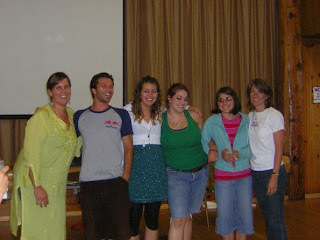 The picture of the group of smiling people, is those of us who helped lead worship. Next to me on my right are the three teens. 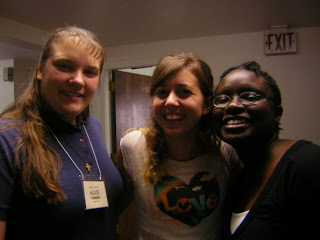 Marieke, Aryn and Becca (who by the way, is from the town in CA that I was born in!). Lastly, I have just met wi th a man who leads a ministry here in San Diego, and who is an EFCA church member. He was an answer to prayer. His spiritual gift is Exhorter,and he was an amazing encouragement. He challenged me to more committed times with God and He challenged me to try to accomplish greater things than I would have imagined here with my organization. He has agreed to be a mentor for me in ministry building (yes, I know that's Gods job, but hopefully you know my intent). He can teach me alot about building networks and meeting people and can challenge me to think bigger. He said he sees a vision for what God is going to do with me, and I am a bit scared but also totally encouraged. If it's gonna happen it is gonna be ALL God! So this meeting was from God I am sure. He is already arranging things around me. I have a meeting with a network of youth pastor next week!!!! Wow! Prayer request? That all my financial partners would finish signing up with my organization so that I can actually begin to do all these things. Without knowing if I am at 100%, I am not officially allowed to begin my job. Please pray that that is resolved soon!